At present, there is no definition of consciousness which is universal and covers all essential characteristics. In a clinical setting, consciousness is reduced into two main components: wakefuleness (i.e. arousal) and awareness (Posner, Saper, Schiff, & Plum, 2007). Wakefulness, refers to the level of vigilance. Awareness is related to subjective experiences and can be subdivided into awareness of the external world (i.e., sensory or perception of the environment) and of the internal world (i.e., stimulus-independent thoughts, such as mental imagery and inner speech). Survivors of severe brain damage classically go through different clinical entities before partially or fully recovering consciousness. 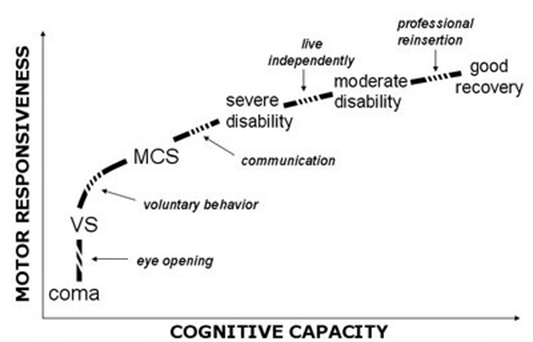 Although the majority of these patients recover from coma within the first days after the injury, some permanently lose all brain functions (brain death), while others evolve to a state of ‘wakeful unawareness’ (vegetative state / unresponsive wakefulness syndrome; VS/UWS) or minimally conscious state (MCS). Exceptionally, patients may awaken from their coma fully aware but unable to move or speak – their only way to communicate is via small eye movements (locked-in syndrome). Brain death means death with the absence of all brain functions. All brainstem reflexes are lost, there is no respiration, and the patient is persistently comatose. There should be an evident cause of coma without confounding factors, such as hypothermia, drugs, electrolyte, and endocrine disturbances (Laureys, Perrin, Schnakers, Boly, & Majerus, 2005). Behavioral and neurological testing should be performed to confirm the diagnosis. Imaging of the brain typically shows the absence of activity in the entirety of the patient’s brain i.e. the ‘empty skull sign’). Differences in brain metabolism measured in brain death and unresponsive wakefulness syndrome, compared with healthy subjects. Patients in brain death show an ‘empty-skull sign’, clearly different from what is seen in vegetative patients, in whom brain metabolism is massively and globally decreased (to 40-50% of normal values) but not absent. (Taken from Laureys, 2005). A coma is a transient condition: patients’ eyes remain closed, even after painful stimulation and hence they remain unaware of the surroundings and of themselves. A coma must last at least one hour to be differentiated from fainting. Autonomous functions, such as breathing and thermoregulation, are reduced, which often requires respiratory assistance. Most patients recover from a coma within the first hours to weeks after injury. However, this recovery may sometimes go no further than the vegetative state / unresponsive wakefulness syndrome (VS/UWS) or the minimally conscious state (MCS).